A new image taken with the Hubble Space Telescope shows the supernova remnant SNR 0509-68.7, also known as N103B. It's the wispy, elongated shell of red gas and dust near the top of the image. 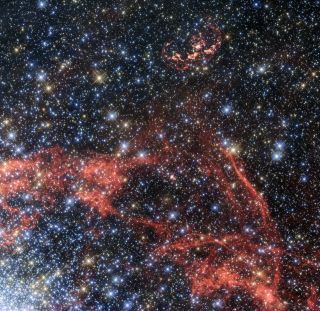 A glittering new image of a supernova remnant — the remains of an exploded star — taken by the Hubble Space Telescope may have also captured a star that survived the detonation. The supernova remnant SNR 0509-68.7, also known as N103B, looks like a gauzy red shell of gas and dust, surrounded by a field of stars. The remnant is located in the Large Magellanic Cloud, a collection of stars that orbits the Milky Way and is locatedjust over 160,000 light-years from Earth. The explosion that took place at the site of N103B is what's known as a Type Ia supernova. In this kind of supernova, the exploding star is a white dwarf, or the dense nugget of collapsed material that forms when a star like the sun runs out of fuel and its internal engine stops burning. Type Ia supernovas are used as cosmic "standard candles," meaning scientists can use these supernovas to measure distances in the universe. There are two main hypotheses for how these stellar explosions occur. The first says that two white dwarfs collide and explode. The second suggests that a single white dwarf syphons material away from a normal star; the accumulation of matter on the surface of the white dwarf eventually builds up pressure and causes the dwarf to explode. In the latter scenario, "the theory indicates that the normal star should survive the blast in at least some form," according to a statement from the European Space Agency's website for the Hubble Space Telescope. "However, to date, no residual companion around any type Ia supernova has been found." In the new Hubble observations of N103B, researchers have found a star that could be one of these missing companions, the ESA said. The star "meets the criteria" that scientists would expect from a star that could feed a white dwarf in this way; it's also located within the right distance range from the center of the site of the explosion, according to the statement from ESA. "This star has approximately the same mass as the [Earth's] sun, but it is surrounded by an envelope of hot material that was likely ejected from the pre-supernova system," the statement said. "Although this star is a reasonable contender for N103B's surviving companion, its status cannot be confirmed yet without further investigation and a spectroscopic confirmation. The search is still ongoing."